I’ll be honest. I’ve never paired any kind of cookie with wine, though I love cookies and I love wine. And I can also say I don’t like sage and I especially dislike apricot. So as fate would have it, I DIG Cookie Zen – Apricot & Sage Cookies! The pairing was fun. The cookies tasted great and I even liked the taste of the sage. Couldn’t really taste the apricot anyway. 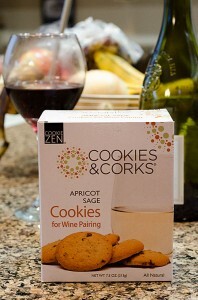 Check out Cookie Zen – Apricot & Sage Cookies!